As I wrote earlier this week, I believe strongly in being intentional, but holding it lightly. These hacks help you do just that. (This is actually three hacks in one.) I have found this process invaluable for all of my projects, both individual and group. Hack #1: Put your goal statement prominently at the top of all of your key documents. You’ll notice that I’ve done exactly that on all of my meeting templates. A prominent field at the top of every document will remind you to have a goal in the first place. A prominent filled-out field will remind you of what that goal is. Minimum Success: The bare minimum indicators of a successful project. Target Success: I also call this “stretch,” because these scenarios should be hard, but attainable. These are the scenarios for which you aim. They should have about a 40-70 percent likelihood of happening if you do your work diligently. Epic Success: Success beyond your wildest imagination. You are not expecting any of these to happen, but they are within the realm of possibility, and you are overjoyed if they do. I also discuss failure scenarios as a way of gut-checking the spectrum. It happens. Need minimum of six enrollees showing up 4-6 times each. 6-8 enrollees. 12 enrollees! People already start inquiring / registering for January 2014 Bootcamp. Regular blog posts. People engaged in website and process. Positive evaluations at the end. Participant assessments give them an accurate sense of how much progress they’re making. Three self-organized “workout” groups, including at least one not in Bay Area. Going through this process as an individual exercise is fairly straightforward (although you have to be disciplined in actually doing it). Doing it with a group requires a much larger commitment, and it can be a lengthy process. Take the time to do it anyway. It’s well worth it. 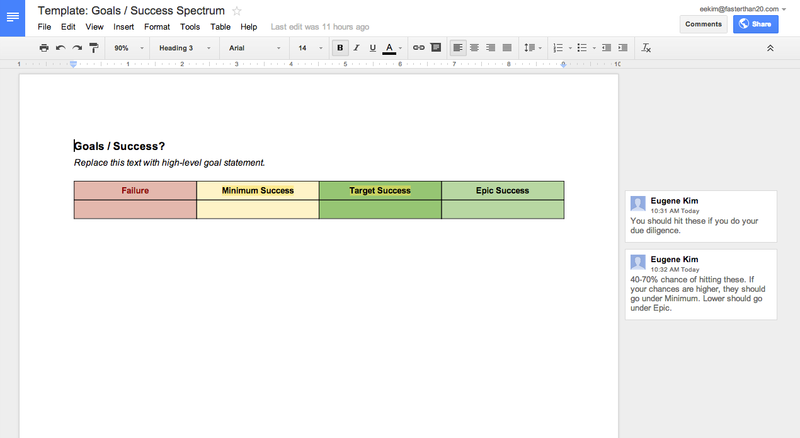 Hack #3: Review your spectrum as part of your project debriefs. It is very easy to lose sight of your original goals throughout the course of a project, especially if the project is long and complex. The spectrum helps keep you grounded and focused. When you do your debriefs, be sure to start by reviewing your spectrum. If you’re doing a group debrief, review the spectrum together. In the case of my official Changemaker Bootcamp launch last August, I wasn’t able to get six enrollees, one of my minimum success targets. A few people had wanted to enroll, but couldn’t make the dates. I tried to reschedule, but the space I had reserved wasn’t available for the new dates. According to my spectrum, the launch was a failure. However, I felt confident that if I could just get enough participants, I could hit many of my success targets. I decided to launch another pilot (I had already done two up to that point), which permitted me to lower my standards a bit. I ended up getting five participants, I hit my other minimum target, and I was about 75 percent successful on the evaluations and assessments. I even partially hit one of my epic targets: Two separate workout groups self-organized, which shocked and delighted me! When you’re doing something hard and meaningful, and when things aren’t going your ways, it’s easy to get morose and start beating yourself up or, worse, panic. My spectrum allows me to maintain a more objective perspective on how well things are going and on what adjustments to make.